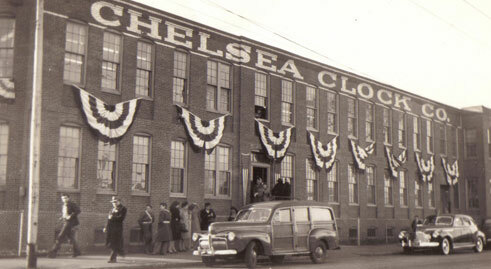 Chelsea's initial roots were unsteady, with its name changing from "Harvard" to "Boston" then "Eastman" Clock before finally settling as the Chelsea Clock Company. Despite the rocky start, groundwork for the finest in American clock making was firmly established via innovation from the country's earliest clock craftsmen. 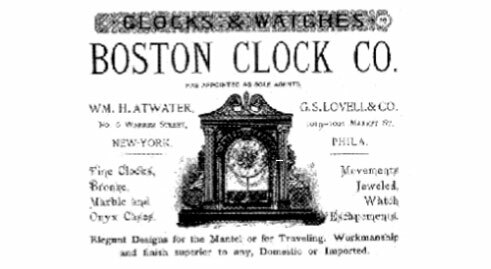 1884Original Advertisement from Boston Clock Company. 1897Boston Clock is sold to Charles Pearson and renamed Chelsea Clock. 1900First Ship's Bell mechanism is designed and patented. 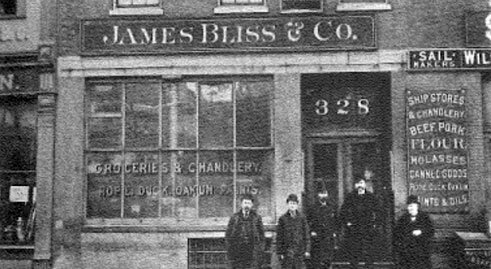 1900Early Chelsea dealer James Bliss & Company in Boston. Chelsea brand begins to gain recognition in the market as innovative clock designs are patented and introduced, relationships with distributors are formed and markeding via print advertisments and catalogs emerge. By 1905 Chelsea had established distribution in every major American city. Early 1900sU.S. 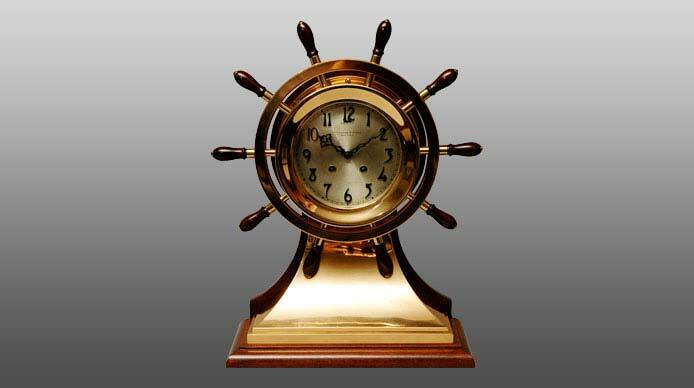 Government agencies begin to order marine clocks. 1902Ad in Country Life promoting the Ship's Bell. 1903Automobile clock production begins for Rolls Royce. 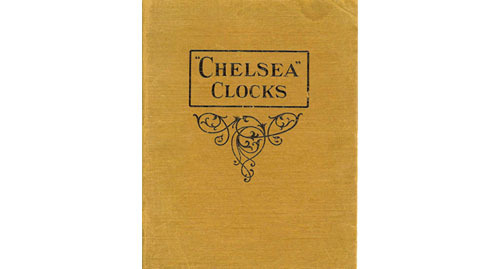 1906Chelsea Clock Company publishes the earliest known catalog. 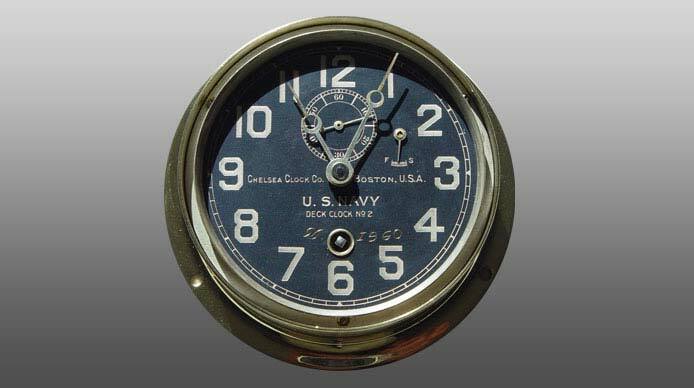 Chelsea Clock continues to receive orders from U.S. Gevernment Agencies for marine clocks in increasing quantities - as a result Boston Clock was formed (a separate brand for clocks the company manufactured to meet government standards). 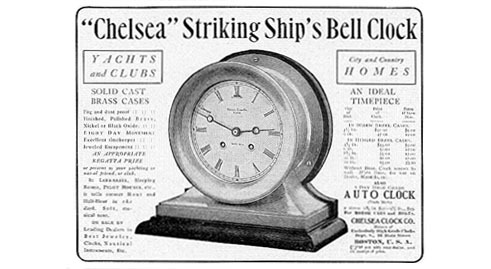 1911Walter Menns patents the Chelsea Automatic Ship's Bell Clock. 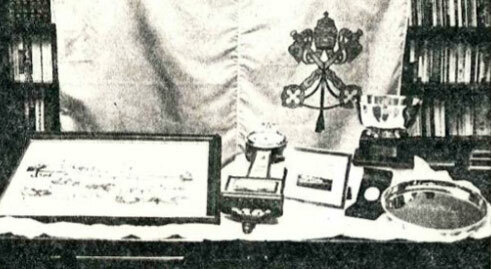 1914Advertisement featuring a Ship's Bell along with candle sticks. 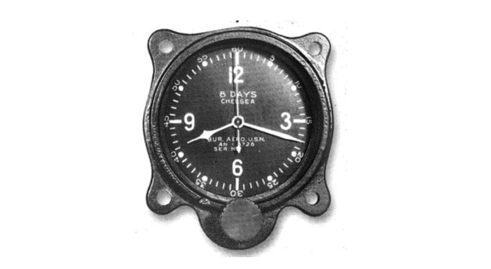 1917The popular automobile clock was modified for airplane installation. 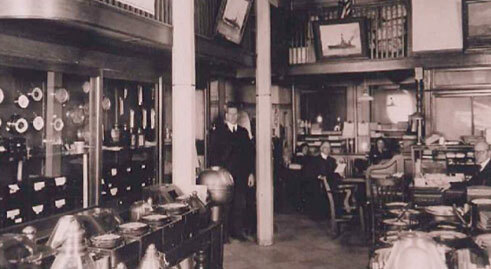 1920One of Chelsea Clock's Oldest Dealers. Wilfred O. 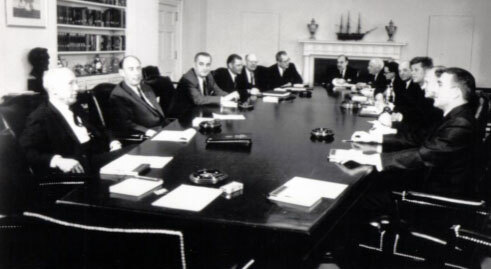 White, seated at desk. 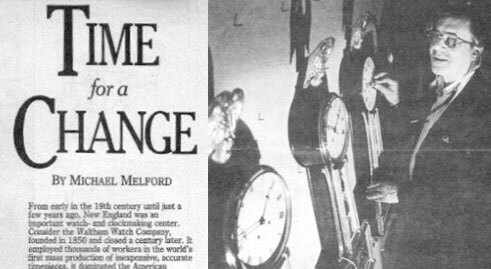 As the country enjoyed a period of growth and prosperity, consumers continue to buy clocks as household necessities. 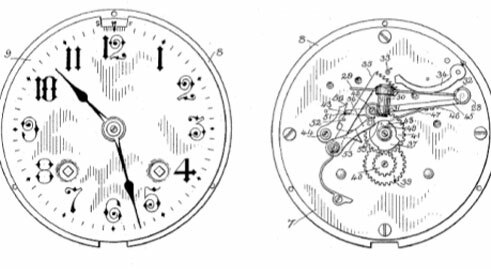 By 1929 competition for clock manufacturing was aggressive - an estimated 56 companies engaged in the manufacturing of clocks and clock movements, an increase of 50% compared to prior decade. 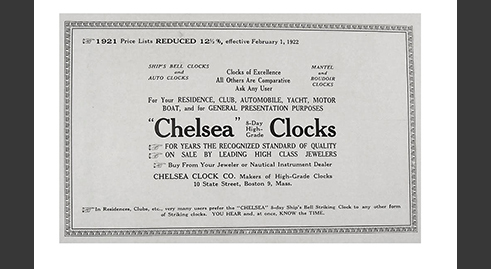 1922Early Chelsea Price Notice advertising 12½ discount off of Clocks. 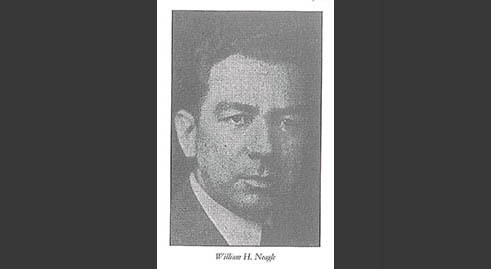 1928William Neagle assumes ownership of Chelsea after Pearson's death. 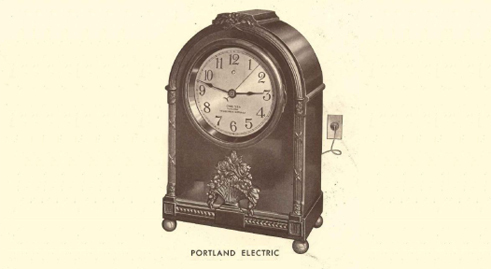 1930Electric clocks are produced to satisfy growing customer demand. Drastic inventory and cost reductions were made in the face of dire economic conditions resulting from the Great Depression, which enabled Chelsea to remain viable while many competitors were forced into bankruptcy. 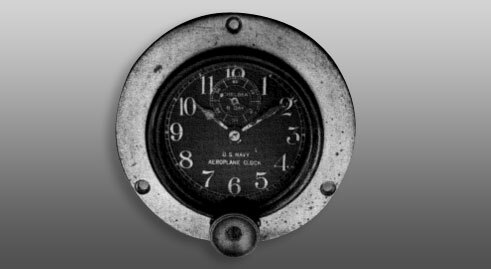 1934Airplane Clock, produced for the U.S. Navy in 1934. 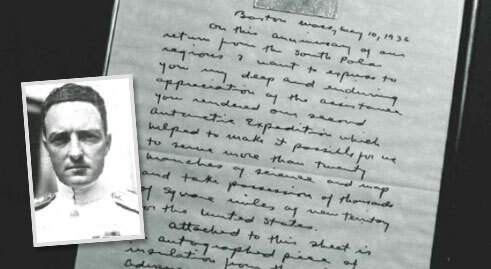 1936Thank you from Admiral Byrd for clocks used on South Pole expedition. 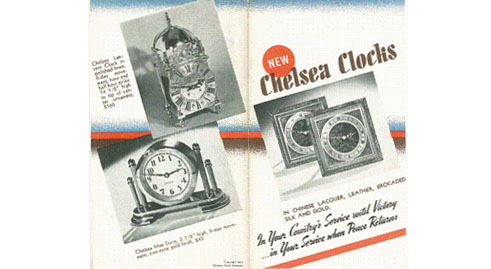 1940War Time Catalog highlights military clocks made during the war. 1940Government orders during WWII helped offset declining sales. During Wold War II Chelsea lives up to its reputation as "Timekeeper of the Sea", producing more in four years than entire production since 1897. 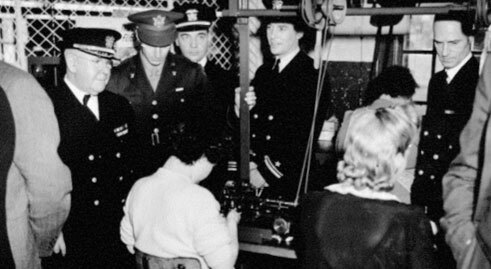 At this time Chelsea was singularly focused on furnishing thousands of clocks to the armed forces for use aboard Liberty ships, Submarines, Destroyers, Cruisers, Battleships and Aircraft Carriers. 1943"E" award presented by the Gov't for wartime production excellence. 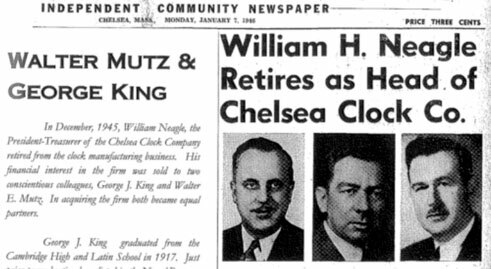 1945Neagle retires and sells Chelsea to longtime employees King & Mutz. 1948Newspaper Ad placed in the Oakland tribune featuring Chelsea. 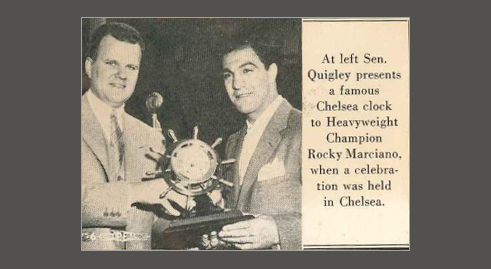 1953A Chelsea Mariner is presented to Boxing Champion Rocky Marciano. 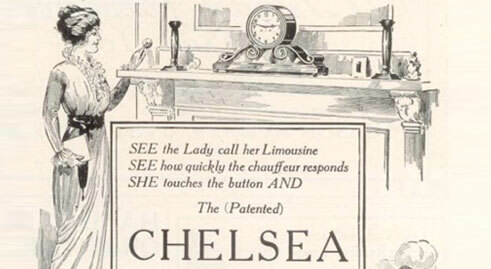 The Chelsea brand was well established in post war American culture, often viewed as the quintessential award or gift of distinction for celebrities ranging from athletes to actors and politicians. 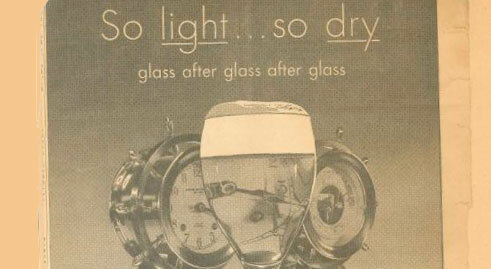 1950sAd placed by Shaefer Brewing using a Chelsea to make a statement. 1956A Chelsea presented to General MacArthur during his campaign tour. 1957Ad in Esquire featuring Chelsea amidst other luxury house wares. 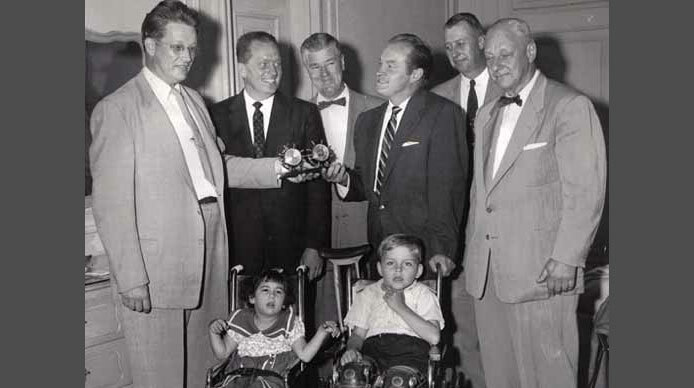 1960Bob Hope accepts a Chelsea award for his humanitarian efforts. 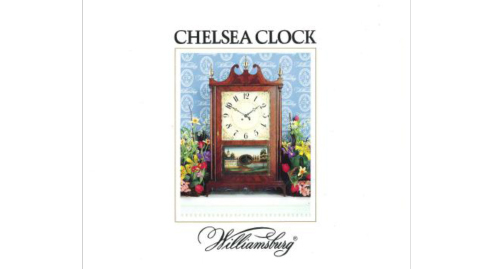 At one time Chelsea competed with dozens of clockmakers, including Waltham and Seth Thomas of New England. 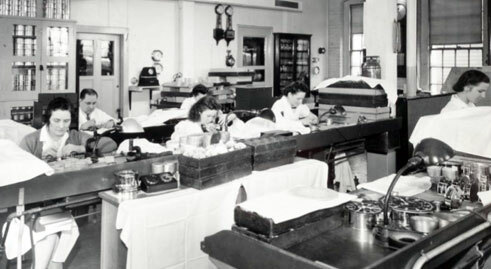 Soon assembly line methods undercut demand for precision timepieces, and the market was further weakened by the introduction of electric clocks, quartz technology and foreign imports. 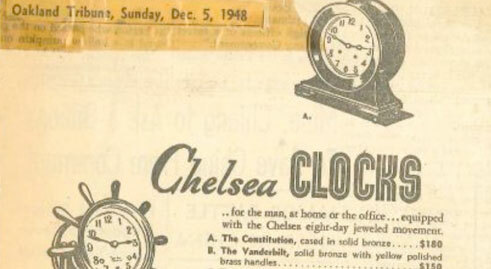 By the late 1960's Chelsea stood as America's only maker of precision spring-driven clocks. 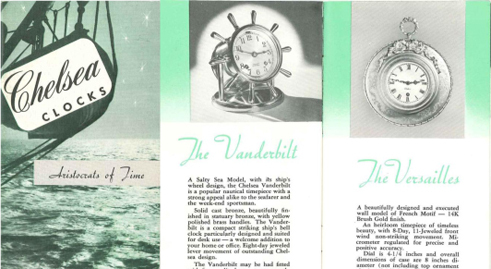 1961Branding evolved from Timekeepers of the Sea to Aristocrats of Time. Early 1960sKennedy administration meeting with a Claremont on the shelves. 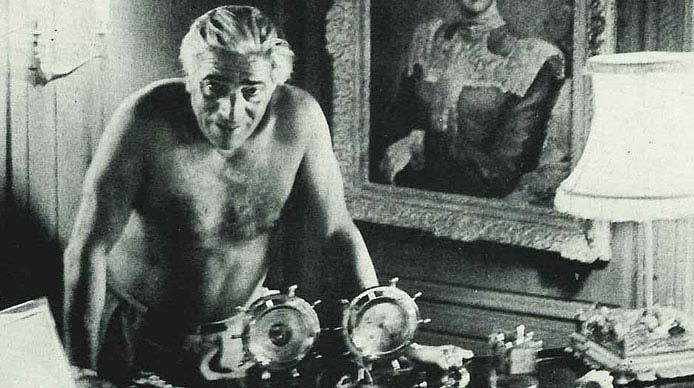 Early 1960sAristotle Onassis with his Chelsea Claremont Clock. 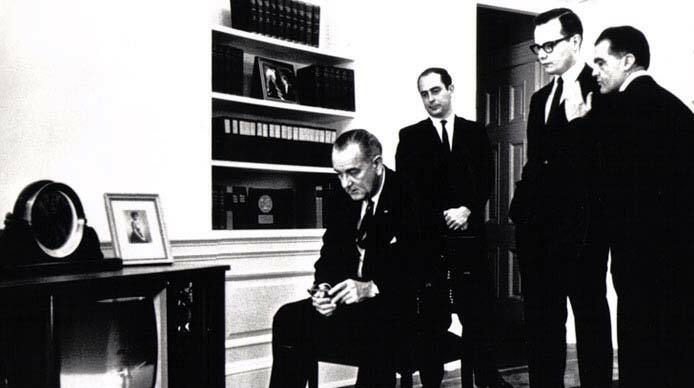 1969President Lyndon Johnson watches a NASA liftoff, along with a Chelsea. Chelsea Clock undergoes a peiod of change as ownership of the company transitions from Mutz and King to Automation Industries, to Bunker Ramo Corporation and finally is sold to Rick Leavitt, a native Bostonian who ultimately runs the company for 27 years. 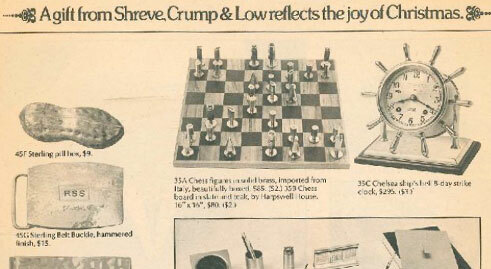 1972Chelsea in a holiday ad from dealer Shreve Crump & Low. 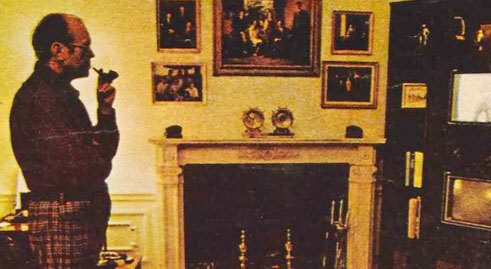 1975President Ford in his study, where a Chelsea rests on the mantel. 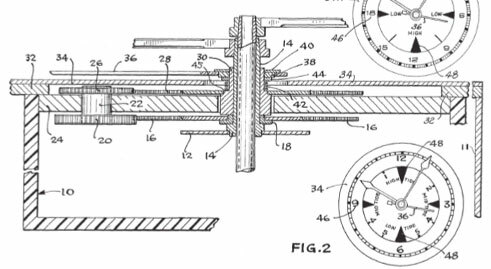 1975Chelsea is granted a patent for the Tide Clock mechanism. 1979A Chelsea is gifted to the Pope during his visit to Boston. Competitions for quartz technology increases, and Chelsea introduces dozens of new designs to retain a leading position in the market. Leavitt requests intervention from US Customs and Massachusetts Attorney General's office to halt counterfeit production of Chelsea Clocks in Taiwan. 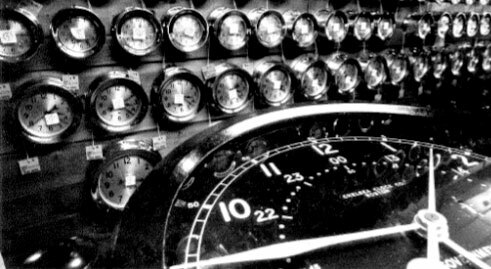 1980sProduction room with clocks on test at Chelsea Clock's factory. 1982Reproduction of the Terry clock as part of Williamsburg Series. 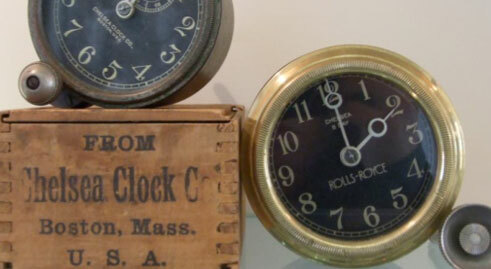 1986Boston Globe features Chelsea's 100 yr old approach to clock making. 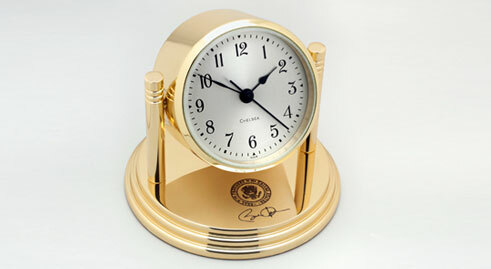 The introduction of limited edition clocks was successful after the 1980's economic recessions and Leavitt expanded on the theme. 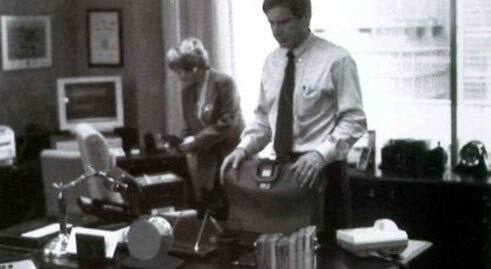 1994Harrison Ford in Clear & Present Danger; a Ship's Bell is shown. 1994Ship's Bells presented as awards at Boston University Alumni Night. 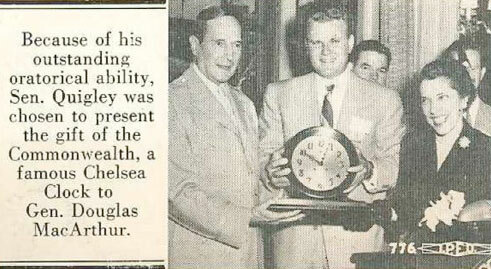 1997Chelsea celebrates 100 years and introduces the Centennial Clock. 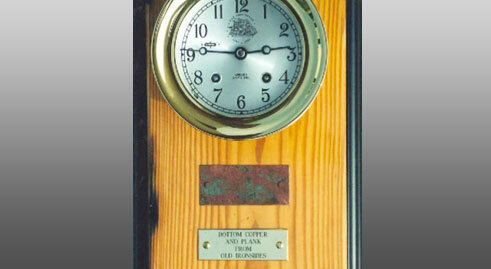 1997Limited edition clocks made to commemorate the USS Constitution. After leading Chelsea for more than 25 years, Leavitt steps down and sells the company to JK Nicholas, a business consultant, entrepeneur, and longtime collector of Chelsea Clocks. A new executive team is established. 2006Chelsea found aboard the USS Saratoga, air craft carrier from 1920. 2009President Obama selects the Dartmouth to gift dignitaries while abroad. 2012President Bush presents a Chelsea to Turkey’s president Ahmet Necdet Sezer. Boston Clock Company, Ship’s Bell Clock, circa 1893. 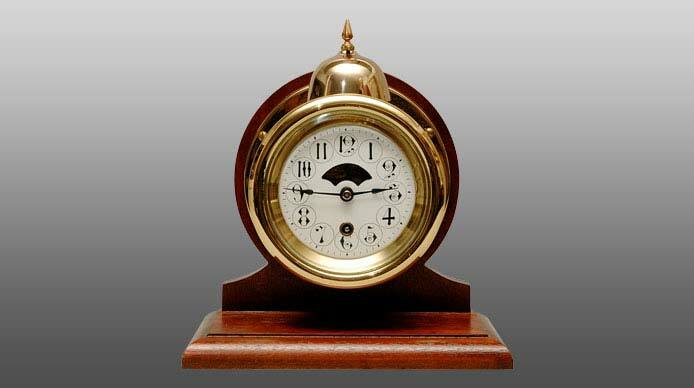 Second marine clock sold by Chelsea Clock Company, serial number 204, September 13, 1897. 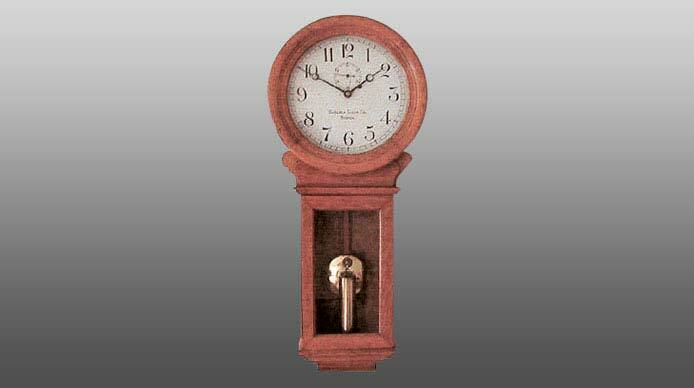 Chelsea Regulator #5 in Mahogany, 1904. Considered the finest regulator commercially sold by Chelsea. Discontinued in 1921, the only known model of this kind to exist today. 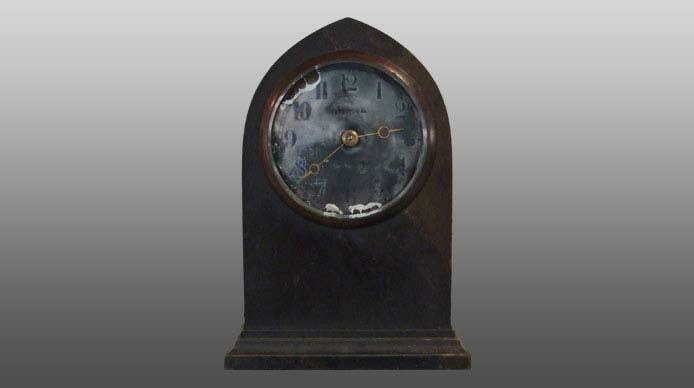 Rare Gothic Boudoir Clock with porcelain dial &ndash; fire damaged; produced from 1906-1926. Style inspired by 13th Century Gothic period, originally made in mahogany as well as cast cases of brass and bonze with a variety of finishes. Oldest known Chelsea Yacht Wheel Clock, circa 1905. 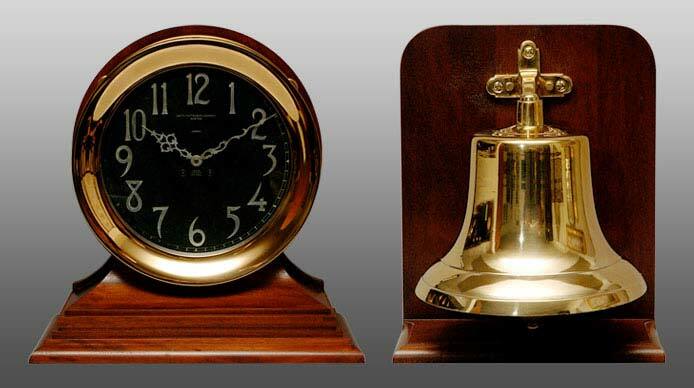 One of the earliest 12″ Ship’s Bell Clocks, circa 1906. 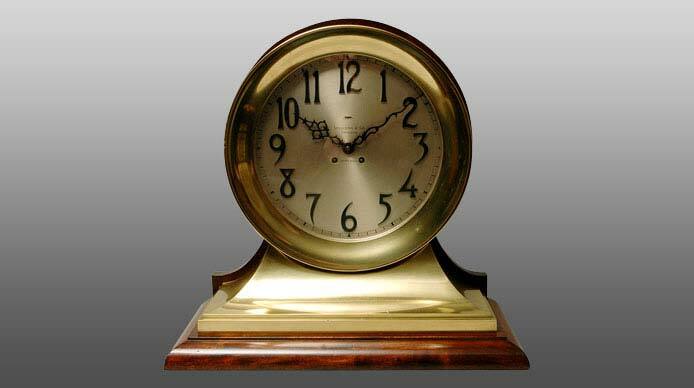 Derry #1 Weight Driven Banjo clock &ndash; 1908. 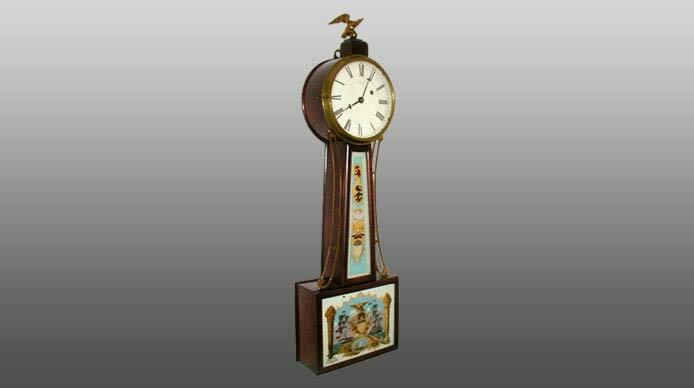 One of only two Derry clocks known to exist, made by Joseph Eastman’s, an early Chelsea founder and watchmaker. 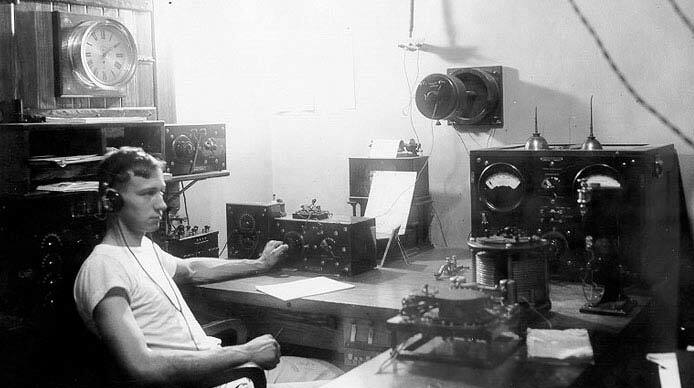 A young man during his shift at the US Naval Observatory, circa 1910. Chelsea Clock shown on the wall. The USNO serves as the official source of time for the U.S. Department of Defense and a standard of time for the entire United States. 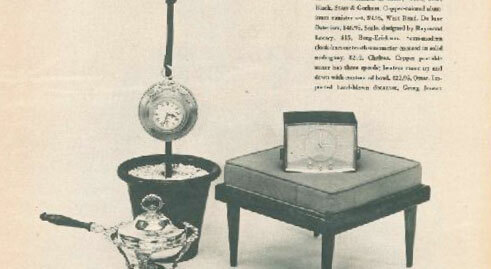 The Chelsea Regulator #3, a pendulum clock featured in the 1911 catalog for $22, now valued at $6000. Popular with the U.S. Treasury Department. Chelsea Carved Yacht Wheel- circa 1914. Carved mahogany demonstrates expert tooling that was followed with an ebonized finish. 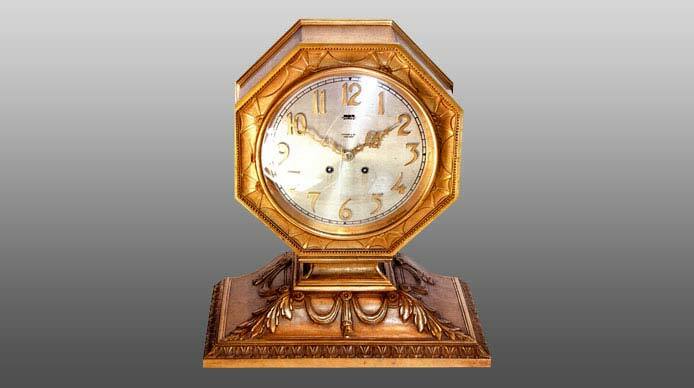 The clock weighs an impressive 54 pounds and is estimated to be valued at $25,000 or more. One of two known 12″ Automatic Ship’s Bell Outfits, circa 1920. 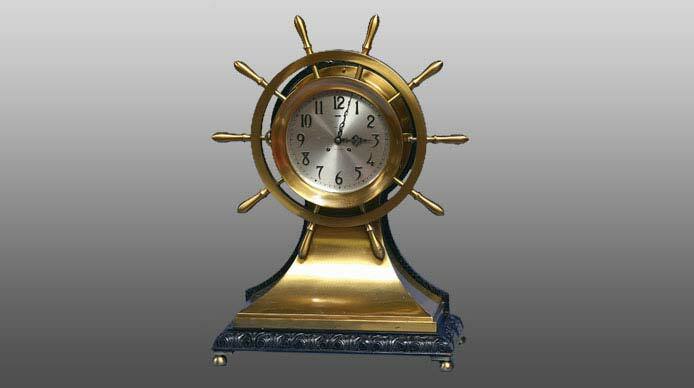 The external bell is operated automatically by the ship’s bell clock. 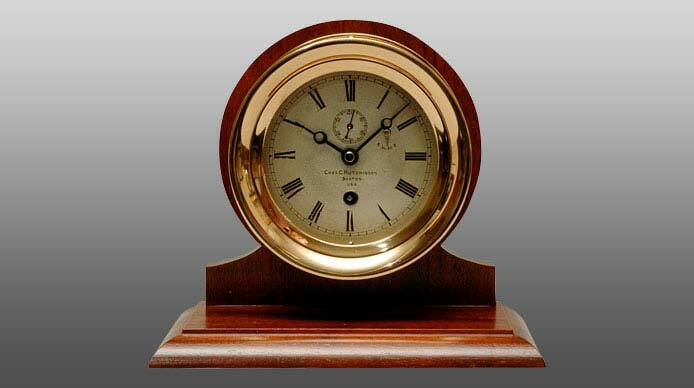 One of two known 12″ Yacht Wheel Clocks, circa 1927, the last of the grand large dial clocks. Tiffany & Co. Clock with Chelsea House strike Movement- sold to Tiffany &amp; Co. in 1928, this clock houses a Chelsea Model M Housestrike movement. Intricate case design and bronze castings by the jeweler feature drapes, oak leaves and fleurs de lis. 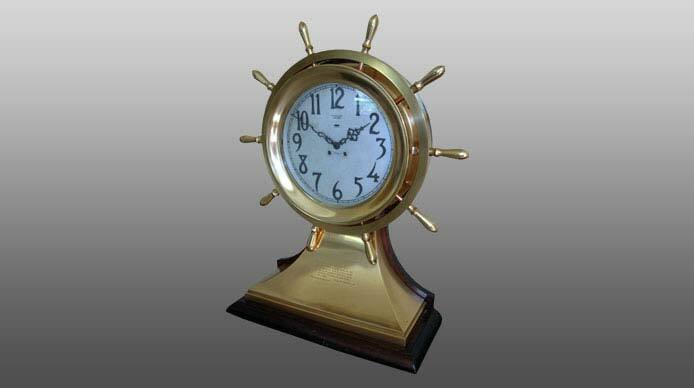 Clock is valued at approximately $9500. 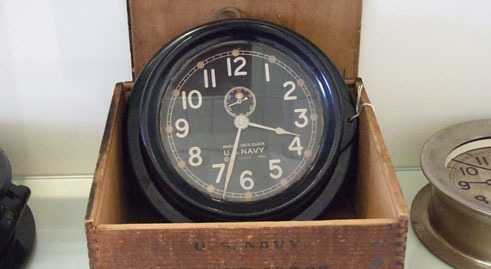 WWII Era US Navy Phenolic Deck Clock- one of thousands produced for the government using Bakelite (a durable plastic/resin like material) instead of brass due to wartime material shortages. 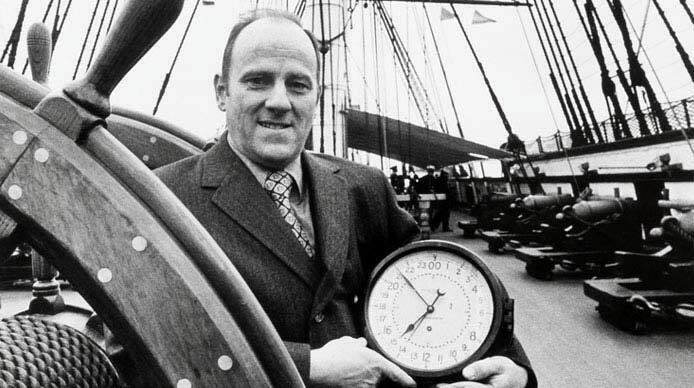 Chelsea Clock VP Bill Hilliard shown presenting a 24 Hour Phenolic Chelsea Clock to the USS Constitution, “Old Ironsides” in the early 1970s. 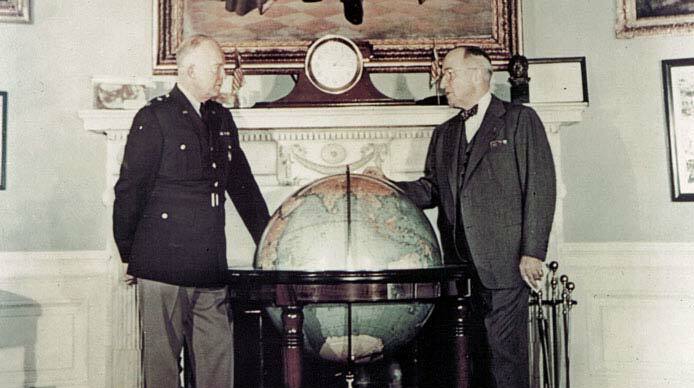 1940s: President Harry S. Truman and General Dwight D. Eisenhower stand before an 8 ½” Chelsea Clock. 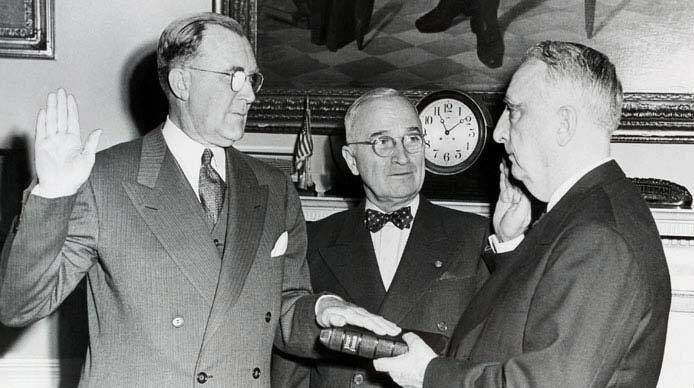 1945: President Harry Truman and a member of his cabinet are sworn in. A Chelsea Clock rests behind them on the mantel. 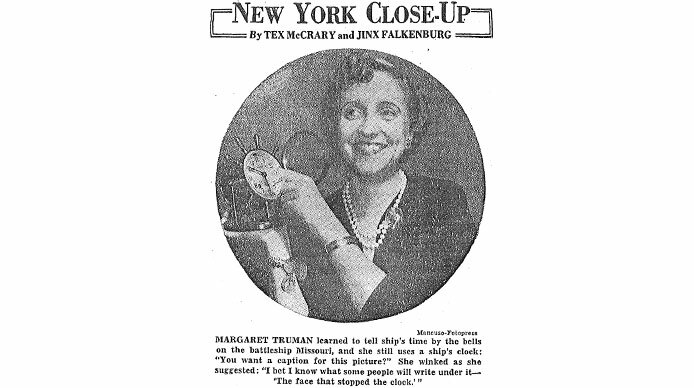 1950: Margaret Truman pictured in the June 26th, 1950 issue of the New York Herald tribune, holding her Chelsea Vanderbilt. 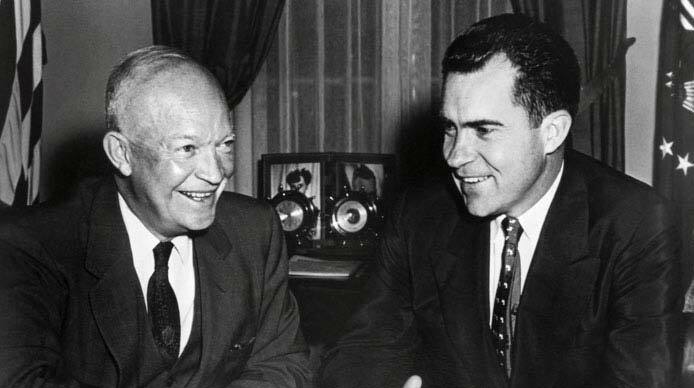 1950’s: President Eisenhower and Vice President Nixon shown in the oval office seated in front of a Chelsea Claremont Clock. 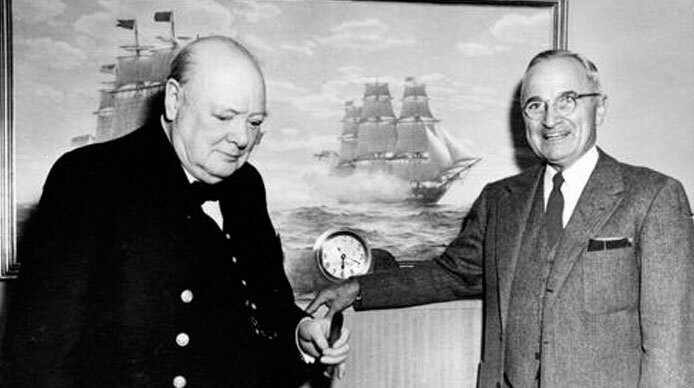 1952: President Truman and Prime Minister Churchill on board the U. S. S. Williamsburg in 1952. 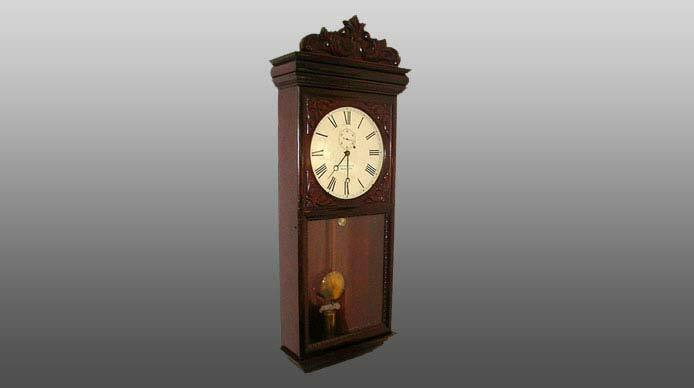 A Chelsea Tambour clock rests on the mantel. 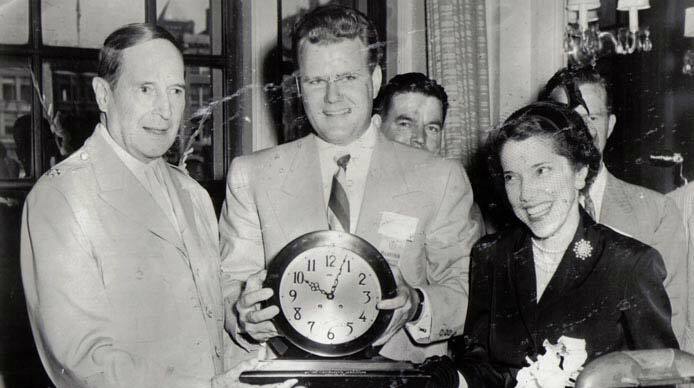 1956: Chelsea Senator Andrew P. Quigley, shown presenting an Admiral Chelsea Clock to General Douglas MacArthur and his wife Jean. General MacArthur made a stop in Chelsea as he was touring the country in preparation for his bid to run for President against Eisenhower in 1956. 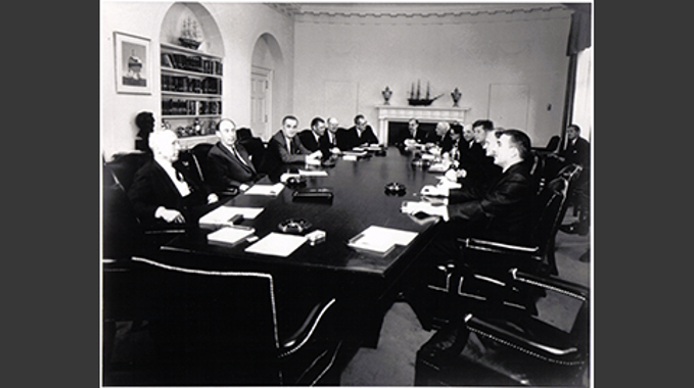 Early 1960s: Kennedy administration cabinet meeting with a “Claremont” on the shelves to the left. 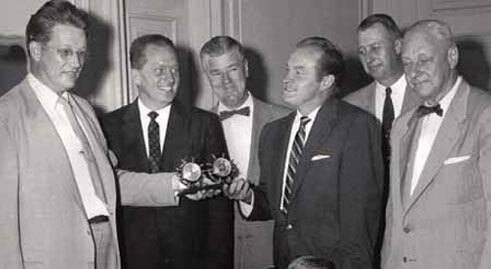 1960s: Bob Hope shown accepting a Chelsea Clock and Barometer award for his humanitarian efforts. 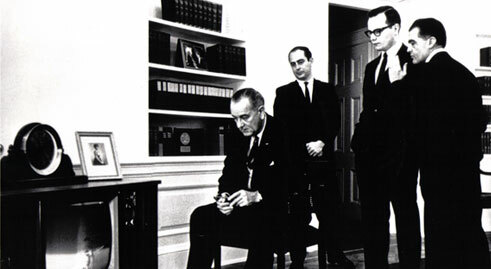 1969: President Johnson watches an Apollo spaceflight from the White House, with his U.S. Navy Chelsea Pilot House Clock resting on his television. 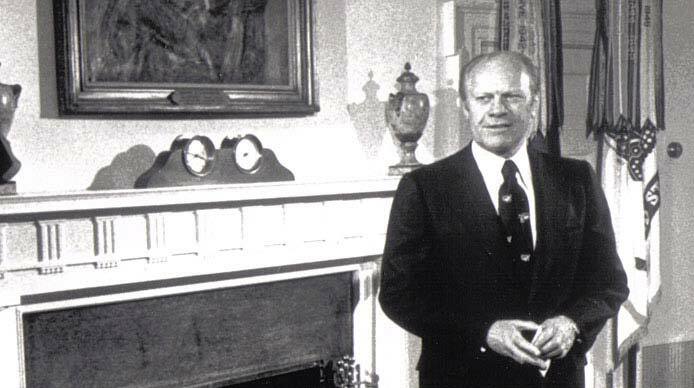 Mid 1970’s: President Gerald Ford in front of the camera at the White House, preparing for broadcast on NBC. A Chelsea Clock and barometer set rest on the mantel. 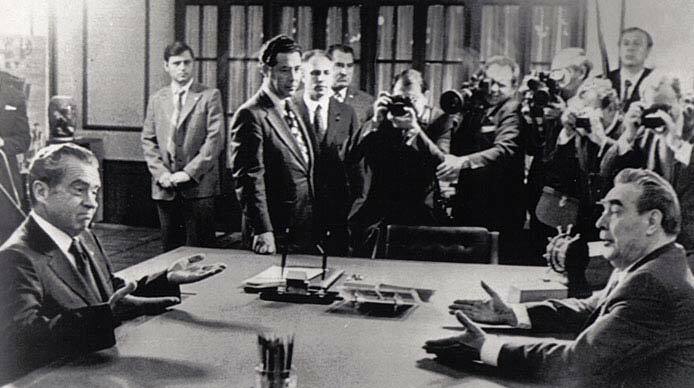 1974: President Nixon and Communist Party Leader Leonid Breshnev at their first official summit meeting in Moscow. A Mariner Chelsea rests on the table, a gift from Nixon. 1978: “An Extravagant Life” by Frank Brady – biography of Aristotle Onassis. 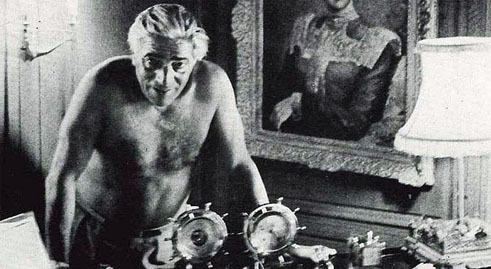 Book cover shows Onassis with his Chelsea Clock and Barometer. 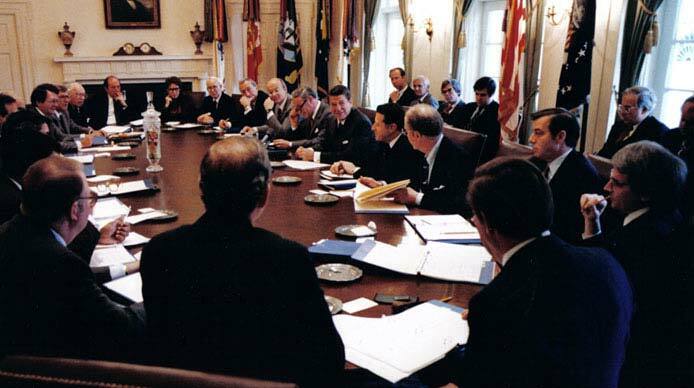 1980’s: Reagan administration cabinet meeting with a matching Chelsea Clock and Barometer set on the mantel. 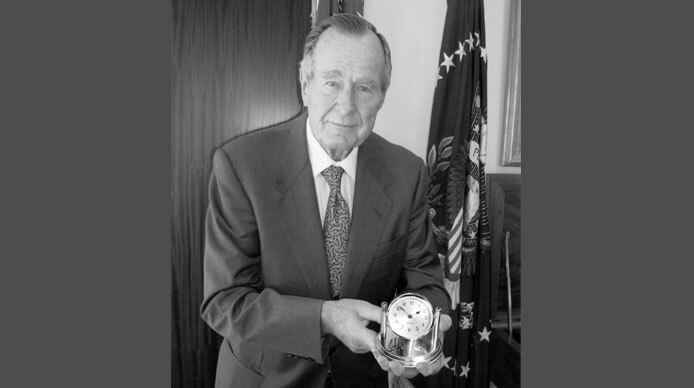 2008: George H.W. Bush holding a Chelsea Dartmouth. 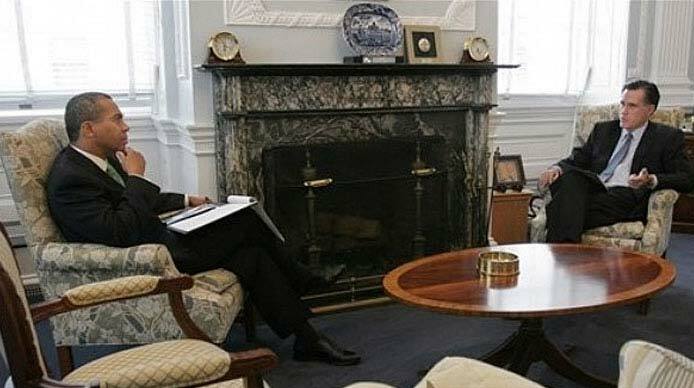 2009: Governor Patrick of Massachusetts and former Governor Mitt Romney shown at the State House with two Chelsea Clocks on the mantel. 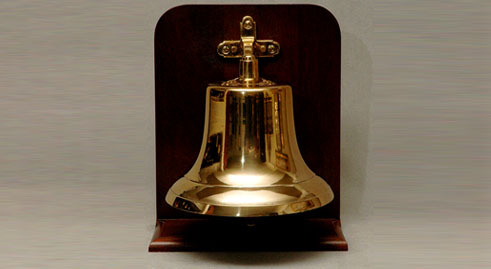 Mariners have used a unique bell code to tell time at sea for hundreds of years. The code is based on the crew’s typical workday routine while the vessel is under way. A ship at sea requires constant attention throughout the day’s twenty-four hours. The day is therefore divided into six four-hour periods, each called a “watch.” Similarly, the crew is segmented into three divisions. Division members then stand their individually assigned duties on two watches per day, with eight hours off duty between watches. To rotate each division’s watch times, the Evening Watch is periodically divided into two watches. These are called Dog Watches because they “dog” the watch schedule for all divisions ahead by one watch period. The watch officer struck the ship’s bell every half hour to apprise the crew of the time. A single bell denoted the end of the first half hour and one bell was added each half-hour. 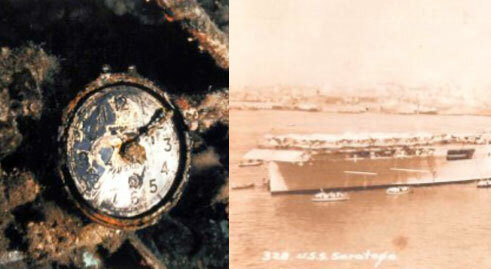 Eight bells therefore signaled the end of each four-hour watch. Like centuries of seafarers, you’ll soon know the time when the clock chimes, even if you cannot see it.